Charming cabin located directly on Bass Harbor. 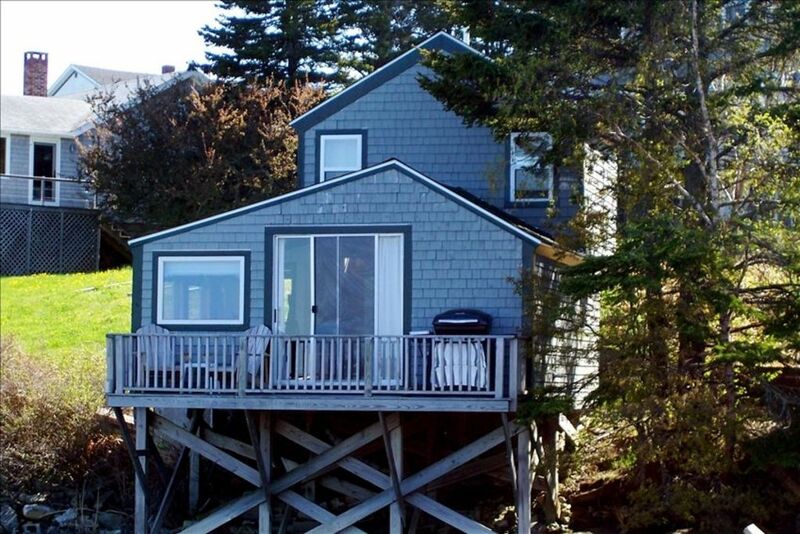 Quiet, awesome views, close to Acadia National Park and other amenities Mount Desert Island is known for.This one bedroom cottage hangs over the water at high tide. The first floor is one room with living/dining area and a kitchen alcove. There is a queen futon in the living room, and a sliding glass door that opens on to the deck. Upstairs the bedroom has a queen size bed and commanding views of the harbor and off shore islands. Harbor and Ocean views, and water access define this location. From our dock next door you will have acess to some of the best kayaking and canoeing in the area. You can explore the very calm and protected inner harbor and for the more adventurous a paddle into Blue Hill Bay on a quiet day is a lot of fun. On a high tide you can cross under the bridge at the head of the harbor and go for miles on the streams into the very heart of acadia National Park. Very few people paddle here in the streams and you will have the fishing and wildlife to your self. Bring your own boats or rent one here locally. My husband and I spent a week in this cottage in October 2018. The location was within a few hours of many attractions yet so peaceful we didn't know anyone else was nearby. The cottage was stocked with every conceivable item we could have used and more. Just looking out the window at the marina while drinking morning coffee was wonderful. The Sea Princess was a great and informative cruise. We also appreciated the Granite Museum when we happened upon it and would recommend it highly. Property was just as listed! We enjoyed this quaint cottage! It was in the perfect location for us. We enjoyed watching the "working harbor". The cottage on the inside was clean, comfortable and very cute. The owners were charming and helpful. We would definitely return! We loved it and would be back in a heart beat. It's a great place to stay and experience the area so many things to do and come back to the perfect place to stay. It was the picture book experience for us. This little cottage couldn't be cuter, and the view of the harbor is spectacular. Perfect spot on the quietside of MDI. Perfect Shorefront home to enjoy this busy working harbor. Great spot to base yourself to enjoy your vacation. Walk to Thurston’s for lunch or dinner. Kayak or bike from the cottage. Close by gentle hike at Acadia Mountain. 30 minutes to busy Bar Harbor or NPS headquarters. Cottage had everything our family of three needed.